One of our favourite archaeological sites in Orkney is the Broch of Gurness near Aikerness Beach in Evie. Situated along the North Coast of the West Mainland, the Broch of Gurness is an especially great place to visit with kids who will have fun exploring the site and playing hide and seek amongst the surrounding ruins. We’ve compiled a list of ten fascinating facts about the broch. 1. Around 500 BC Iron Age inhabitants of Orkney began to build strong circular houses as the main dwellings for their farms. Some formed the centres of small agricultural villages. The Broch of Gurness is one such building, constructed between 500 and 200BC and abandoned some time after 100AD. It was eight metres tall with an internal diameter of 20 metres. The Broch of Gurness was capped by a conical wooden roof covered with thatch, turf or seaweed. It was surrounded by numerous dwellings which housed up to 40 families. 2. The Broch of Gurness is located along the coast in a good defensive position, surrounded on the landward side with fertile fields, above a fine beach for hauling out boats and close to fishing grounds. There is evidence of 11 brochs along this stretch of coast between the Mainland and the Island of Rousay. The area was an important part of Orkney during the Iron Age; the sea was vital for transportation and food. 3. Brochs are unique to Scotland; there are approximately 500 brochs and most stood alone. In Orkney, most brochs were surrounded by a village. There is debate about whether the imposing Broch of Gurness was a status symbol or a last defensive resort for the villagers. However, there is no evidence of fighting or the violent destruction of brochs anywhere in Scotland. It is possible then that brochs served as a deterrent, but most likely, they were the residence of the most important family in the community. Brochs may have also served as gathering place for communal activities. 4. The people who lived here were prosperous farmers in communication with other parts of Scotland. There may have been small squabbles but this was generally a settled society. That said, the Broch of Gurness was tricky to get into. There were two outer gateways to access the settlement. Once inside the settlement there were two doorways into the Broch of Gurness itself. A pivot stone on which a heavy door swung can be seen (pictured above). There are square holes in the Broch passage wall to hold a stout wooden bar for the door. 5. The Broch of Gurness had thick walls, a central hearth, stone built cupboards and a well. That said, since finding Minehowe in Tankerness in 1999, archaeologists have re-evaluated the well. Was it for collecting water or was it a subterranean structure? During the Broch of Gurness’ life, there was a collapse in its walls; a new staircase was added and the well covered over. The interior of the Broch would have been supplemented with wood and may have had a raised floor. Inside the Broch of Gurness, treasures such as weaving tools, looms, an oil lamp, and iron knife were found. The surrounding dwellings all had large living rooms and a storeroom. They contained a hearth, sleeping spaces, cupboards and a large tank set in the floor. 6. Life at the Broch of Gurness would have been busy and hard. It would have been noisy and smelly; quiet during the summer when folk spent the long days in the fields and at the sea, and claustrophobic during the winter as folk worked inside on bone tools, straw ropes, animal skins, pottery, and metal working. For food, large quantities of barley were grown. Cattle were reared for meat, milk and leather. Cattle would have also assisted with the ploughing of fields. Sheep, goats, pigs, hens and geese were also kept and other Iron Age food sources included wild plants, shellfish, fish, seals and small whales. 7. No one knows why the Broch was abandoned in 100AD. Evidence indicates that people perhaps became less keen to live in communal societies and began setting up scattered individual farmsteads instead. Archaeologists have found fewer buildings from this period, and have speculated that the Orkney population declined in the centuries before the Vikings arrived. However it is also possible that Orcadians during this period began building with timber, so their dwellings would not have survived to this day. 8. A striking Pictish building called the Shamrock House is visible when entering the site today. This was not located here originally but was moved from an area south of the broch to allow excavation of underlying levels. It was built long after the Broch of Gurness was abandoned, dug into the rubble of the earlier settlement. It was a small house with a central hearth, four outlying chambers (giving it the shamrock shape) and a low thatched roof. Beside the Shamrock House is a rectangular building which was possibly a byre for cattle. 9. Vikings settled in Orkney after 800AD and they tended to use earlier settlement sites for their burials. A Viking woman was found buried near the Broch of Gurness; she wore a fine cloth garment, an iron necklace, and a pair of oval patterned brooches (pictured above). An iron sickle and a wooden-handled knife was also found in the grave; goods to accompany her into the next world. Other Viking artefacts were also found nearby, indicating that the area contained more than the one Viking grave. 10. The Broch of Gurness was discovered in 1929. Orcadian poet Robert Rendall was sketching on a grassy mound when one of the legs of his stool sank through it. On further inspection Rendall found a staircase leading down into the earth! It was then carefully excavated. During excavation the Broch was called the Broch of Aikerness. 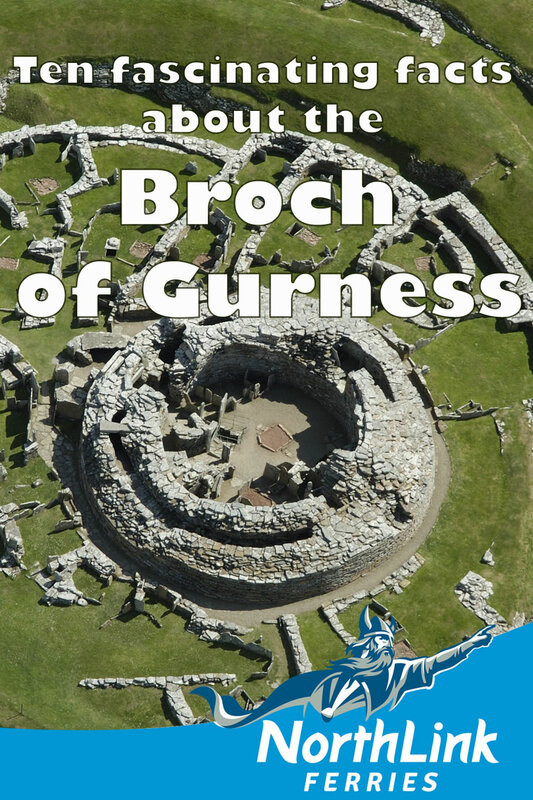 Could the Broch of Gurness be that name pronounced by an Orcadian tongue and misheard by an archaeologist? Orkney really is a photographer's paradise; make sure you don't forget your camera when visiting! We hope you enjoy our 25 outstanding pictures of Orkney's birds, seals, ancient monuments, beaches, cliffs and sunsets. If you're searching for an amazing dessert with an Orkney flavour to wow your guests at a dinner table then our Highland Park Clootie Dumpling is well worth a try! George o’Neill, Sous Chef on MV Hamnavoe offers us his take on a beautiful traditional Orcadian pudding. Orkney and Shetland have been populated for over 6000 years, and through the course of these Islands' history the languages spoken there have changed many times. However it is Old Norse that has had the greatest influence on modern place names. Read our guide to find out what the island, area and house names of Orkney mean!